Is there a delicate balance between lightness and darkness within each of us? Dr. Jekyll searches for a way to eliminate the evil that he believes exist in all of us. But what Dr. Jekyll discovers instead is that he feels confined by his respectable behavior. As Mr. Hyde, he is able to shed his good-guy image and engage in his wild side without worrying about society’s judgment. When we first meet Mr. Hyde, we know him only by description: a small, brute of a man. 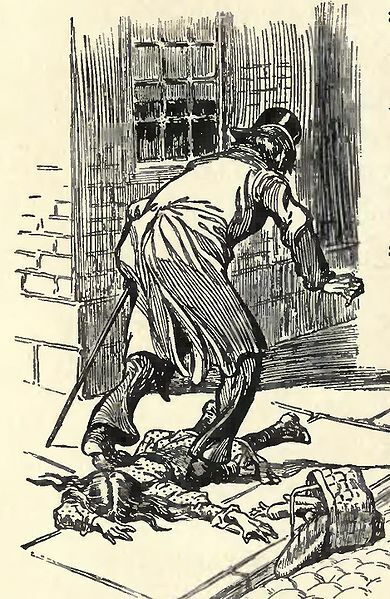 He charges down the sidewalk, knocks down a small child and doesn’t stop to see if she’s OK.
Mr. Richard Enfield talks about this incident to his friend, lawyer Mr. Gabriel Utterson, as they walk thru this same neighborhood some days later. Enfield said he ran after the man, collared him and brought him back to the scene. “There was the man in the middle, with a kind of black, sneering coolness – frightened, too. I could see that – but, carrying it off, sir, really like Satan,” Enfield said. To avoid a scandal, Hyde entered the door of a “certain sinister block of building” – the one that Enfield and Utterson were now near – and returned with a check for a hundred pounds. Mr. Edward Hyde’s name was on the check. But, so was Dr. Henry Jekyll’s – one of Utterson’s clients. Back at his office, Utterson removes a file from his safe. It is Jekyll’s will, and Hyde is named the sole beneficiary. Utterson fears for his client’s life. Utterson is unaware that a mutual friend, Mr. Lanyon, knows a great deal more about Dr. Jekyll and Mr. Hyde. Jekyll wrote to Lanyon and insisted he visit Jekyll’s home. But, it was Hyde who greeted Lanyon. Hyde mixed some chemicals and drank it down in one gulp. His body and features began to change before Lanyon’s eyes. Lanyon, who at one time dismissed Jekyll’s experiments as “unscientific balderdash,” now sees how wrong he was. “O God!” I screamed, and “O God” again and again; for there before my eyes – pale and shaken, and half fainting, and groping before him with his hands, like a man restored from death – there stood Henry Jekyll! The sight so horrifies Lanyon that he dies shortly after this encounter. At times, Dr. Jekyll attempts to subdue the internal beast that wants to take over. But Hyde shows up unannounced and commits unspeakable acts. The doctor begins to avoid his friends while he searches for a chemical solution to rid himself of Hyde forever. When Hyde emerges, however, he is stronger than ever. One moonlit night, a maid witnesses a savage attack on another man. She tells police that Hyde turned on the man and beat him with a stick. Then, Hyde fled the scene. Police found a letter on the murder victim addressed to Utterson. Utterson identifies the man as Sir Danvers Carew, his client and a popular member of Parliament. Utterson is alarmed when he sees the murder weapon. He gave Dr. Jekyll the cane as a gift awhile back. He suspects Hyde got it from Jekyll. 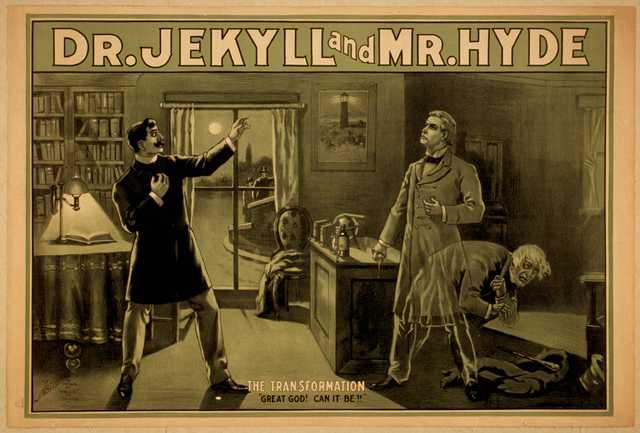 Dr. Jekyll shuts himself off from his friends and Hyde seems to have disappeared. One night, Dr. Hyde’s butler, Mr. Poole, visits Utterson. He’s quite agitated and insists that Utterson come with him. He’s convinced that Hyde has harmed Dr. Jekyll. When they break down the door to Dr. Jekyll’s chamber, Hyde is at the desk and he is dead. As Utterson goes thru his client’s papers, he discovers the mask that Dr. Jekyll chose to wear. Dr. Jekyll and Mr. Hyde were one and the same. Is the lure of the dark side part of human nature? “The true test of a man’s character is what he does when no one is watching” said John Wooden, an American basketball coach. What type of horror story or scary movie do you turn to this time of year? There is a strong whiff of Halloween in this post, which is what you intended, of course. This time of year I turn to Washington Irving for “The Legend of Sleepy Hollow” or even “Rip Van Winkle.” Poe’s good too – “The Tell-Tale Heart. I’ve always like the scratchiness of etchings such as those you depict here, recalling many good childhood memories. Another wonderful post, Judy! Thank you, Marian. Yes, Halloween and the masks we choose to wear are responsible for this post. “The Legend of Sleepy Hollow” is one of my favorite stories. Poe’s stories are another spooky favorite. I think people are drawn to the fictional scary, Judy, in hopes of keeping the real scary at arm’s length! Carrie … Anonymous comments tend to bring out the ugly side in some folks. When I think of angels and demons, I think of that man or woman you encounter in traffic. On any other occasion, probably the nicest folks you ever hope to meet. But, on the road, they are aggressive drivers and exhibit road rage that can be quite frightening. I believe I worked with this guy. Or maybe is was just a close relative! Evil lurks! I push for the cold , removed and disinterested . . . but the other me usually surfaces more often.
. . . damn him! Life would be a lot easier if he didn’t . . .
Diana … Maybe that fascination hints at our dark side. More than likely, it’s like a thrilling roller coaster ride. It’s enjoyable as long as we feel the scare is not for real and we’ll be safely back on terra firma. I live in an apartment and kids don’t come here for candy. When I was younger I sure did enjoy dressing up for Halloween Judy! Extra bonus: Today was Calgary’s 10th annual Zombie walk. It’s always fun to see those brain eaters. Oddly, I did not take any pictures! D’oh! WHAT were you thinking? No photos of zombies? I think that all successful horror stories have both dark and light, and actually, the more dark the better. When I think of all the stories that have made me cringe, shiver or tremble, they have an abundance of darkness, and as a reader I search for signs of the light. One of my favorite dark vs. light Stephen King stories is THINNER. Tonight as I walked with my grandchildren after dinner–it was very dark and we had to carry flashlights–my 11-year-old grandson began talking about THINNER and how he thought the main character was much darker than the gypsies that were supposed to be the evil characters. Good insights for one so young; I was just very surprised that he’s read the book. i love the fictional scary, surprise twist scary, more than the slasher type of scary. i think we all can identify with having a part of us that is a bit darker than the other side, though in some people it is extreme. This book is on our curriculum for GCSE – the exams taken here at age 15/16. It is one the students either love or hate, but whatever, it’s a great story. I’m with Jill on The Silence of the Lambs – the most horrible film I’ve ever seen. Jenny … I just re-read “The Strange Case of Dr. Jekyll and Mr. Hyde” by Robert Louis Stevenson. 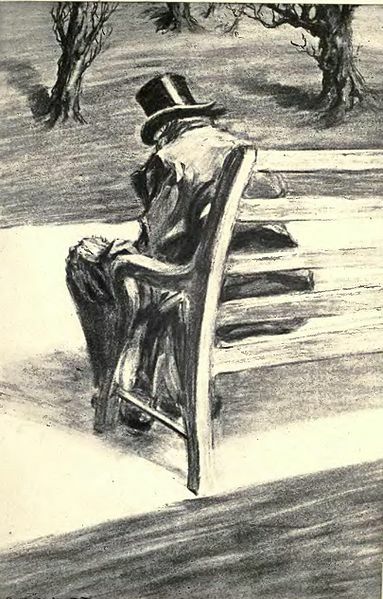 I was surprised by the many interpretations I’ve seen of it over the years – SCOPE magazine, a video (animated), and an old movie starring Spencer Tracy. I much prefer the novella. About “Silence of the Lambs,” I have not seen tthe movie and never will. The subject matter is too disturbing and very close to a real murder case I read many years ago. I do love this time of year it brings out the creativity in all of us but me and horror films they just don’t go together . I was the child at the back of the settee when doctor who was on . I think it has to be Michael Jackson and thriller for me …pure genius. Interesting post, Judy. I also enjoy the old illustrations. I’m not really a fan of the slasher horror movies. The recent “It Follows,” which was referenced in an episode of The Good Wife two weeks ago, updates the teen girl horror genre and gives it a nice twist. My husband and I are fond of the old horror movies that don’t show any gore–“The Innocents” with Deborah Kerr, based on The Turn of the Screw, is one example. “The Uninvited” is another good one. Both The Uninvited and The Innocents show up on TCM sometimes. I do your love your new blog theme by the way, very smart! I’ve not seen this one before. Thanks, Suzy. It’s the “Melody” theme. I love the display of the photos and the clean typeface. I know what you mean about folks who have a side they don’t want others to see. Eventually, they do anyways. Unfortunately this very thing happens to millions in their addiction to drugs and alcohol. These chemical demons release the very worse in us all. So very true, Carl. Unfortunately. Very cool Halloween post Judy. We do not celebrate it, but the younger generation seem to be taking it on. I was always fascinated by this story as a young child. It use to scare me to think we all might have an evil dark side. Watching it as a child his dark side seemed very evil to me. But as I aged and grew a little wiser, I could see that we humans all have a dark side and its the choices we make which define us. So true, Kath. The scariest “Dr. Jekyll and Mr. Hyde” movie I saw starred Spencer Tracy. From what I recall, the movie took many departures from the book.